You may recall that the other month I developed a methodology for seasonally adjusting the monthly world trade figures from the WTO. 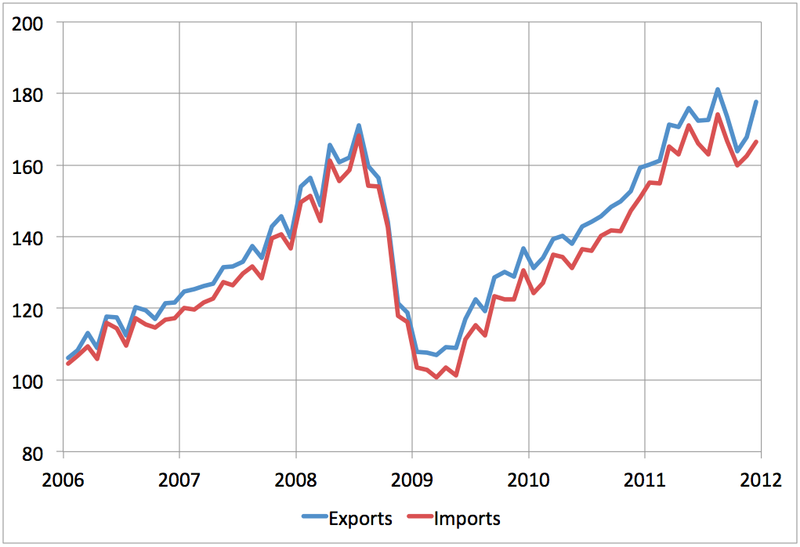 This revealed a sharp drop in global trade in October. I then went on to apply this to November, and today give preliminary figures for December (based on a sample of 19 countries that have reported so far). December (like November before it) shows some recovery from the October drop, but it is not yet back to the level of October. The agreement between Imports and Exports is only partial here (probably reflecting the noisy nature of the preliminary estimate). Overall, it appears that global trade has flattened out since mid 2011, but the October drop has not led to a sustained contraction like 2008 (probably because the ECB has so far succeeded in preventing calamitous institution failure in Europe). It looks possible that some of the October drop may have been due to businesses waiting to the last possible moment to order Christmas merchandise thus meaning that some of the normal fall surge in the non-seasonally-adjusted numbers was delayed, causing a drop then a rise in the seasonally adjusted series.